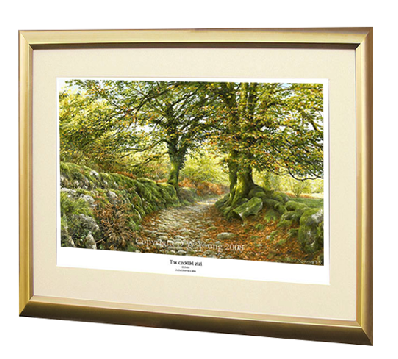 Save £30 on these beautiful matching pair of Dartmoor Lane limited edition prints. 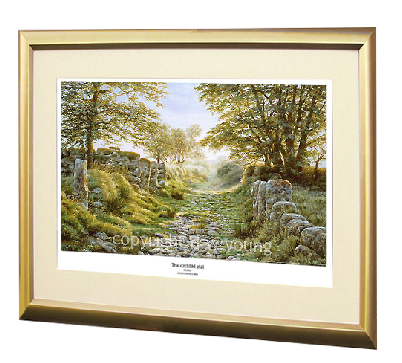 Normally £250 for the pair, these two atmospheric pictures of Norsworthy Lane at Burrator and Swincombe Farm Lane in the heart of the moor are now available at £220 for the pair, including a choice of frames and a ‘thank you’ set of Dartmoor greetings cards worth £18.00. A wonderfull atmospheric print of the full moon rising between the twin crags of Dartmoor’s Hound Tor, said to be the inspiration for Conan Doyle’s Hound of the Baskervilles. This limited edition print in a 2’’ silver & grey/blue frame is now on sale at the reduced price of £127.50 due to this moulding now being discontinued. The size of print with the frame is approximately 32 X 17 inches and comes glazed and ready to hang. Postage is of course free.